Click here to see 1961 Post baseball cards! 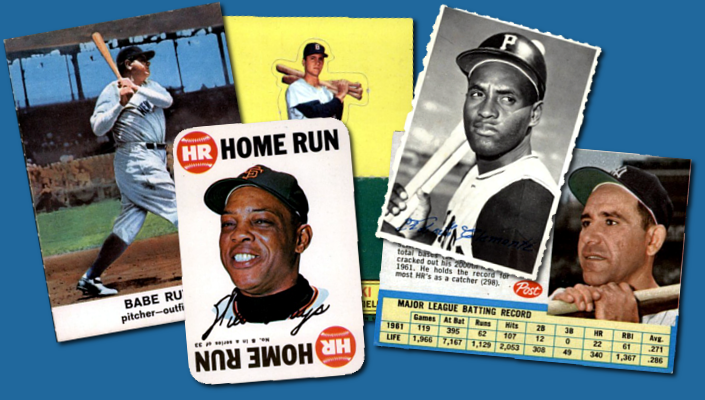 The 1961 Topps Baseball Card Set includes 587 standard size cards, measuring 2½" by 3½". The subsets for the 1961 Topps baseball cards are the League Leaders (cards 41-50), World Series Highlights (401-410), MVPs (471-486) and All-Stars (566-589). The 1961 Topps set has more than its share of design mistakes. The last card in the set, Warren Spahn was mistakenly given #589, skipping cards #587 & #588. The Braves Team Card was supposed to be given #426, but was mistakenly given card #463, along with the other #463 Jack Fisher. The hard-to-find 1961 Topps High Number Series starts at card #523. The key 1961 Topps Rookie Cards are Hall-of-Famers #35 Ron Santo, #141 Billy Williams and #417 Juan Marichal. CLICK HERE if you want to sell your 1961 Topps Baseball Cards. Showing 1 to 100 of 616 products.